Ingredients 1 ½ cups Hazelnuts, skinless 4 tbsp sugar 250g semi-sweet chocolate, finely chopped ¼ cup Lactantia® Unsalted Butter, cut into cubes ½ cup Lactantia® 35% whipping cream ¼ tsp salt Instructions In a food processor, blend the hazelnuts and sugar until smooth and almost peanut butter like. This will take between 2-4 minutes. Place chopped chocolate in a bowl and set over a bain marie (pot of boiling water, you place the bowl on top of the pot). Bring the Lactantia® 35% whipping cream to a boil and pour over chocolate. Add the Lactantia® unsalted butter and mix until melted and incorporated. Remove the bowl from the bain marie, and using a whisk, mix the nut mixture into the chocolate mixture. Pour the chocolate hazelnut spread into 1 x 500mL jar and let cool. Seal and refrigerate. Waffles, toast, fruit… everything tastes better with a little Lactantia® Chocolate Hazelnut Spread. Store the spread in a tightly sealed glass jar and you’ll always have a homemade treat on hand! In a food processor, blend the hazelnuts and sugar until smooth and almost peanut butter like. This will take between 2-4 minutes. Place chopped chocolate in a bowl and set over a bain marie (pot of boiling water, you place the bowl on top of the pot). Bring the Lactantia® 35% whipping cream to a boil and pour over chocolate. Add the Lactantia® unsalted butter and mix until melted and incorporated. Remove the bowl from the bain marie, and using a whisk, mix the nut mixture into the chocolate mixture. Pour the chocolate hazelnut spread into 1 x 500mL jar and let cool. Seal and refrigerate. Whip your next dessert into delicious shape with Lactantia® Whipping Cream! It’s the perfect companion to any sweet indulgence. Pour Lactantia® 35% Whipping Cream into a cool bowl and whip at high speed while adding icing sugar and vanilla. Whip to your desired thickness and refrigerate. Top off desserts or beverages with a heavenly dollop! Trusted since 1947, Lactantia® Butter has earned the reputation for being the finest-quality butter with a smooth, rich and creamy taste. 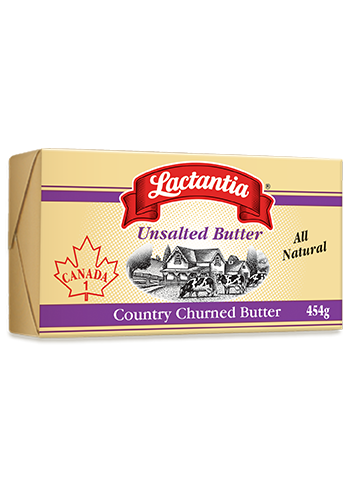 Lactantia® butter is traditionally made with churned 100% pure pasteurized cream. Canada’s number one brand of butter is available in many varieties to suit your taste and lifestyle.